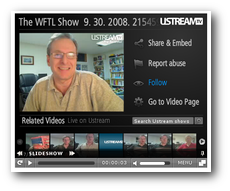 This is WFTL Bytes!, your occasiodaily FOSS news show featuring the latest Linux and FOSS news with your host, Marcel GagnÃ©. WFTL Bytes! is a fast, fun, occasionally a bit goofy, but always informative look at technology news and events as seen from a free and open source software perspective. This includes Linux and everything that that orbits it. Watch! Enjoy! Comment on the stories. I want to know what you think and what you’ve got to say, either about the show in general, the topics covered, of the stories themselves. Tell your friends, relatives, co-workers . . . tell everybody! That’s it folks, go subscribe to WFTL Bytes and check out Marcel’s latest press hat. Bye. Hi! Great blog! Nice to meet another open source supporter! Saw your link on the WFTL bytes site, and Ive also followed your recommendation about Battle for Wesnoth and downloaded it!